E-105 ζ, commonly known as Zeta, is an Eggman robot from the E-100 Series that appears in Sonic Adventure. Originally, Zeta was a purple android built in the same style as his "brothers" E-101 to E-104, but the robot was later rebuilt as a gargantuan mechanism within the Egg Carrier. In this form Zeta serves as a boss for E-102 γ at the end of Hot Shelter. Zeta is first seen aboard the Egg Carrier in Gamma's story, when Dr. Robotnik gathers the E-100 Series in the main hall to send them out on a mission: the capture and retrieval of Froggy. Eggman requires Chaos's tail, which has attached itself to the amphibian, in order to restore the God of Destruction to full fighting fitness. Gamma is dispatched to Emerald Coast while Epsilon, Delta and Zeta go to search elsewhere. Gamma is the last one to return to the Carrier - and the one who actually caught Froggy. Zeta has brought back a gold-coloured frog, and the Doctor is rather unforgiving of failure, banishing Delta, Epsilon, and Zeta with "All you worthless hunks of junk, begone!". Along with his brothers, Zeta is teleported away in a cyan beam of light. The next time Gamma sees E-105, he has been rebuilt entirely - suffering a similar penalty for failure as E-101 Beta. After witnessing the transformation of E-101mkII, E-102 reneges against Robotnik and decided to "liberate" the E-100 models by destroying them. Gamma hunts down his transformed younger sibling in the core of Hot Shelter, commencing the boss fight. Much different to Gamma's previous boss fights, Zeta is battled on a rotating ring-shaped platform (which is just below where Amy's version of the level ends). The robot spews missiles out of its eight launch tubes; Gamma has to avoid them while firing back at the cannons to take them out. With Zeta's eventual defeat, Gamma has only two targets left: the next is Beta. In his Hot Shelter form, E-105 is made of six Dreamcasts! Take a close look at the grey blocks under his cannons. In Sonic X, unlike the other E-100 robots, Zeta only made a short cameo right before being destroyed by Gamma. Its role that it had in Sonic Adventure was taken over by E-101 Beta. 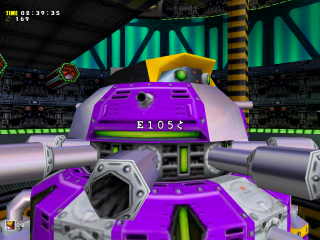 E-105 Zeta's character model, as seen in Sonic Adventure.